Getting a complete night’s sleep is essential to overall health. Sleep Thru is a unique blend of herbs that supports restful sleep and healthy adrenal function. When the body’s stress pathways are naturally supported, one can rest more easily and consistently. This formula promotes restorative sleep all night long, allowing you to feel refreshed upon waking. This statement has not been evaluated by the Food and Drug Administration. This product is not intended to diagnose, treat, cure, or prevent any disease. The thyroid gland is an important regulator of metabolism, with its effect reaching throughout the entire body. * Two primary glands in the endocrine system, the pituitary and the hypothalamus, help to regulate the thyroid gland. The thyroid gland then goes on to produce hormones (known as thyroid hormones) with the amino acid tyrosine and iodine as precursors. Since the thyroid can affect practically every cell in the body in a wide variety of ways, normal thyroid function is essential to health. Unfortunately, many people suffer from thyroid difficulties, one of which is low levels of thyroid hormone production. Coleus forskholii and natural iodine promote a healthy metabolism while L-Tyrosine supports healthy levels of thyroid hormones. 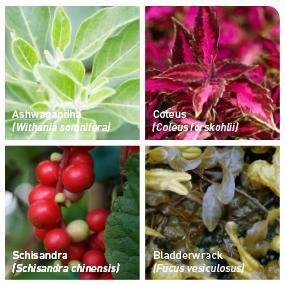 * Adaptogenic botanicals, such as Ashwaghanda and Schisandra, provide non-glandular, vegetarian support for the thyroid gland. * These statements have not been evaluated by the Food and Drug Administration. This product is not intended to diagnose, treat, cure, or prevent any disease. Gaia Herbs is a certified organic, vertically integrated grower and manufacturer of premier botanical supplements. Serving customers since 1987, our more than 300 products offer seed-to-finished product purity, integrity, and potency. Gaia Herbs Rapid Relief Echinacea Supreme supports immune response at onset. Echinacea has been used successfully for hundreds of years to support immune health. 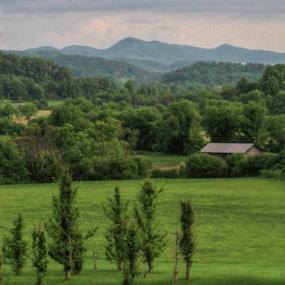 Gaia Herbs’ Echinacea purpurea is grown on Gaia’s own certified organic farm. Concentrated for a fast-acting response, Echinacea Supreme contains the full spectrum of Echinacea phytochemicals- including alkyamides, the constituents most effective at initiating an immune response. Echinacea is a wildflower native to North America. While echinacea continues to grow and is harvested from the wild, the majority used for herbal supplements comes from cultivated plants. The root and/or the above-ground part of the plant during the flowering growth phase are used in herbal medicine. Conditions that come rapidly can go rapidly, when you give your body the right support. Gaia Herbs’ RapidRelief products deliver results fast so you can get back to health and well being. Gaia Herbs Lactation Support optimizes healthy lactation. An ample supply of breast milk is critical for the health of your nursing child. Made with certified organic herbs, Gaia Herbs Lactation Support promotes healthy lactation and optimal nutrient composition of breast milk. Herbs in Gaia Herbs Lactation Support, such as Fenugreek and Red Raspberry Leaf, contain naturally occurring B vitamins, Vitamin C, and Beta-Carotene. Gaia Herbs Lactation Support ensures a gently nutritive blend. 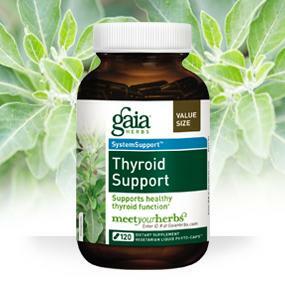 Gaia Herbs System Support Thyroid Support supports healthy thyroid functions. The health of the thyroid gland impacts how you feel on a daily basis. Because Thyroid Support helps regulate metabolism, every major system in the body is affected by altered levels of thyroid hormones. Gaia Herbs’ unique formula supports normal thyroid hormone production – helping you maintain optimal weight, neuromuscular tone, and cardiovascular health. The thyroid gland is one of the most important regulators ofmetabolism, its effect reaching throughout the body. It is inturn regulated by the two master glands of the endocrinesystem, the pituitary and the hypothalamus. The thyroid glandproduces hormones (known as thyroid hormones) from theamino acid tyrosine and from iodine. Since the thyroid canaffect practically every cell in the body in a wide variety of ways, normal thyroid function is essential to health. Sitting atop the kidneys are the adrenals, two-triangle shaped glands whose main job is to produce hormones that are essential for living. Each adrenal gland is composed of two structures: the outer part is called the adrenal cortex, while the inner part is called the medulla. Both structures produce various hormones and neurotransmitters. Stress hormones are released as part of the body’s fight or flight response. They cause physiological changes, such as an increase in heart rate, a release of glucose for quick energy, a boost in mental focus and immune response, and a shutting down of digestive and reproductive functions. Unfortunately, stress can be constant, and the adrenal glands may be continually called upon to secrete stress hormones. Many people experience adrenal fatigue which is characterized by feelings of fatigue, difficulty concentrating, occasional indigestion, weight gain, compromised sleep, and lowered resistance. 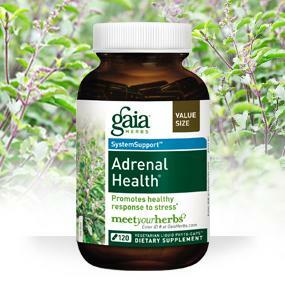 Many of the herbs in Adrenal Health are adaptogens, a class of herbs that help the body adapt to physical, emotional, and environmental stressors. 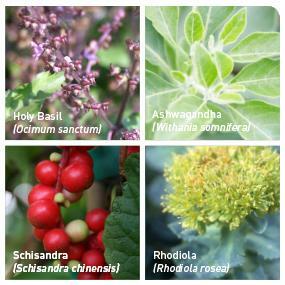 * Rhodiola, Holy basil, Ashwagandha, and Schisandra are all adaptogenic herbs. *This statement has not been evaluated by the Food and Drug Administration. This product is not intended to diagnose, treat, cure, or prevent any disease. Gaia Herbs is a certified organic, vertically integrated grower and manufacturer of premier botanical supplements. Serving customers since 1987, our more than 300 products offer seed-to-finished product purity, integrity, and potency. *This statement has not been evaluated by the Food and Drug Administration. This product is not intended to diagnose, treat, cure, or prevent any disease.